Since the beginning of the year, market capitalisation has fallen by 44.3% from the level of 611bn USD. At the moment, the cryptocurrency market is estimated at 340bn USD. The shares of the top three leaders are 61.41% and are shown in Figure 1. On the 29th of March, bitcoin’s market cap made some astonishing gains to reach 45.79%, which is the highest value since the beginning of the year, according to data from coinmarketcap. 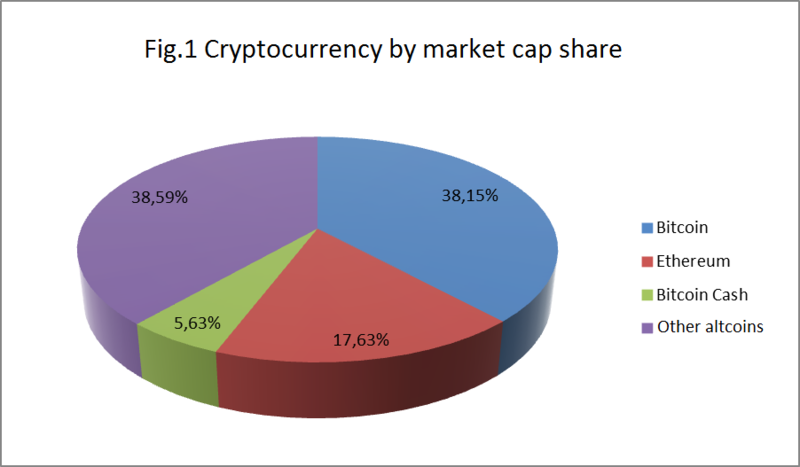 Now, the share of the cryptocurrency market leader has dropped to 38.15%. Also, from the 1st of January to today, the daily trading volume of bitcoin has fallen 2.8 times – from 12.4bn USD to 4.29bn USD, and its price plummeted 47%, dropping from 14,317 USD to 7,581 USD. On the 5th of May, the price of bitcoin reached a Q2 high of 9,948 USD, while a low of 6,561 USD was recorded on 1 April. If we examine the bitcoin chart from a technical analysis point of view, we can draw the following conclusions. On the daily chart (D1), we can see that bitcoin is trading below the 23.6 Fib retracement level. Several bullish attempts to gain a foothold above this level have fallen short. Bitcoin underwent lateral movement after its February fall to 6,000 USD. The situation isn’t expected to change very much in June. The crypto-asset market is awaiting the G20 summit in July this year, where the fundamentals of the global regulation of digital currencies will be discussed. In my opinion, Q3 may prove successful for bitcoin holders, since newly enacted legislation may lead to certain big players, mainly institutional investors as mentioned earlier, entering the market. It is expected that bitcoin will continue its lateral movement in June. Local support and resistance levels are at 6,300 USD and 9,600 USD respectively. ← Are ICO-Chaser Lawyers the New Ambulance-Chasers?